The Italian composer turns in a polished, but passionless, soundtrack. Dario Marianelli has scored all but one of Joe Wright’s five films, the exception being last year’s hyper adventure flick Hanna, which featured the Chemical Brothers’ thumping techno soundtrack. 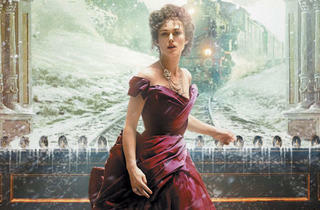 Now that Wright has boomeranged back to adaptation and period drama with Anna Karenina, Oscar-winning Marianelli is back on board with a typically sweeping soundtrack loaded with the sumptuous orchestration and pleasant yet predictable motifs that characterize his work for Wright’s Atonement and Pride & Prejudice. The Italian composer’s score sounds suitably Slavonic in places—there are elegant echoes of Shostakovich’s Jazz Suites all around—and fleetingly French in others, yet the music suffers from the same flaw as the film: stylistic excess. Marianelli’s singular sound is so precise and glossy that it smothers the opportunity for any truly emotional moments. The exception, ironically enough, is “The Girl and the Birch,” based on the same traditional Russian folk song that Tchaikovsky slipped into his Fourth Symphony. Beautifully sung by British-Kazakh vocalist Aruhan Galieva, the piece tells of a young woman deceiving her older husband and is one of the few moments that captures the deep despair of the novel. Yet Marianelli isn’t writing for Tolstoy’s Anna, but instead for the disarming diva as envisioned by Wright and actress Keira Knightley in the film’s fantastical adaptation. His soundtrack ticks all the boxes we’ve come to expect in a Wright period drama: technically polished prettiness, bombastic orchestration and predictable brushes of comic flair. Given that Marianelli and Wright worked together closely throughout the filmmaking process, it’s not surprising that both creations feel somewhat disingenuous and lacking in the one thing this story hinges upon: passion.